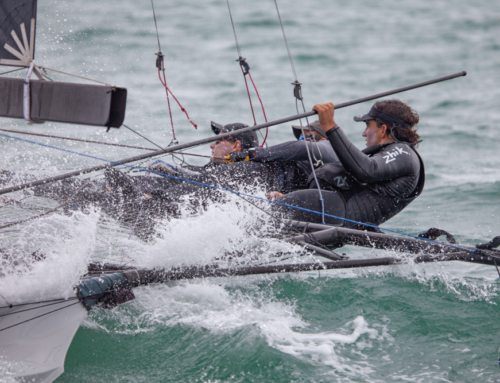 Yamaha (18′ Skiff) and Okaday (12′ Skiff) are currently leading the Auckland Skiff Championship after six races. Over the weekend of the 5-6th November, a fleet of 18’s and 12’s hit the water for some fast paced racing. In the 18′ Skiff fleet, Yamaha are dropping a second place from race three after finishing first in every other race, however the wins didn’t come easy, with both Knight Frank and C-Tech putting up a hard fight. Race 1: Yamaha won from start to finish, however ripped their kite and were forced to head back to shore to make a swift change. Race 2: Maersk Line was late to the start, however even though Yamaha sailed back to the race course after changing their kite, they managed to just make the start and won from start to finish even though they broke their halyard mid race. 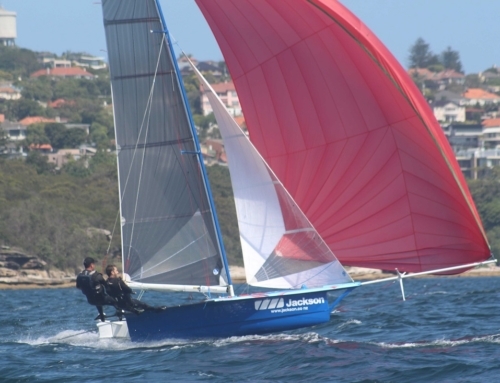 Race 3: C-Tech took out race three while Yamaha here forced to sail the race with no kite due to the broken halyard. Race 4: Maersk Line Yamaha were on fire again and won the race from start to finish, but Knight Frank did make the win a challenge, nipping at their ankles. Race 5: Yamaha won the start but C-Tech and Knight Frank managed to pass them up the first work. At the first downwind mark, C-Tech and Knight Frank got tangled up together giving Yamaha an opportunity to break through. But after a bad hoist for the second downwind, C-Tech managed to get in front. 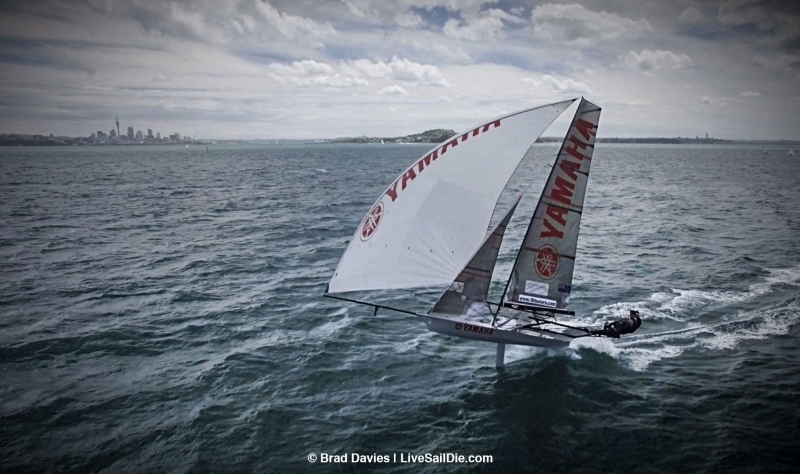 The battle was on for the win and Yamaha managed to sneak ahead by a whisker to take it out. Race 6: Maersk Line decided to call it a day and headed back in before the start of Race 6. Yamaha had a shocker of a start and went the wrong way up the first work. Knight Frank had a strong lead leaving behind C-Tech and Yamaha. But for the final moments of the race, C-Tech and Knight Frank went the wrong way leaving everything open for Yamaha to take the win by a mile. 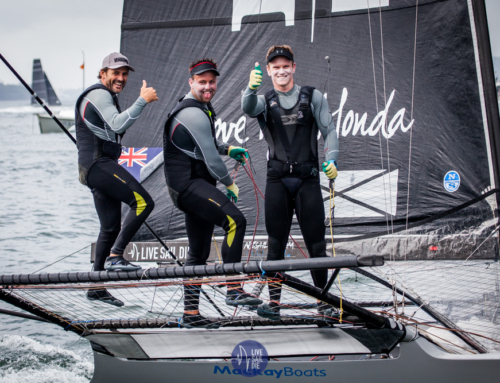 Maersk Line were dealt an array of challenges all weekend and to finish on the podium, Maersk Line are going to need to bring their A-game to the final two days of racing. The 12′ Skiff fleet had an exciting weekend with Monkey Wrench heading out on a Day 1 with the 3rd rig to allow for lighter crew while Mr. Scuff and 12 Gauge took for 2nd rig. The race course proved a fun challenge with tide considerations and the only tactical gybe being a gybe set at the top. Mark spotting proved to be an important aspect of the racing with variations each leg to keep everyone on their toes and the sun was out in full force which was also gains all round. On Sunday the 12’s had rather long races and lumpy seas which tested boat handling skills that will be required in the upcoming interdoms in Brisbane in the new year. Both fleets will be out again this weekend for the final two days of Auckland Skiff Championship racing.